This is the first game in the Puzzle Quest series. 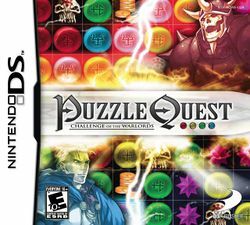 For other games in the series see the Puzzle Quest category. Puzzle Quest: Challenge of the Warlords is a combination Puzzle game and RPG set in the Warlords universe. Basically it is an RPG that utilizes a puzzle system to handle combat between the protagonist and the many enemies scattered throughout the world. Originally a demo was released for Windows and the game was then released for the Nintendo DS and PlayStation Portable. Eventually the game was ported to a number of other systems. This page was last edited on 10 July 2017, at 11:31.